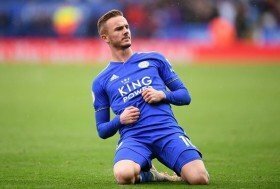 Maddison: Arsenal target this summer? The Gunners are looking for a replacement for Aaron Ramsey, who is to join Juventus on a free transfer in the summer and Unai Emery has reportedly made Maddison his primary target as a replacement. Ramsey will sign a four and a half year contract in Turin. Leicester City manager Brendan Rodgers is eager to keep hold of his midfield star, but the interest of Arsenal is sure to tempt the creative midfielder. The Foxes signed Maddison for a fee of around £18 million and has bagged six Premier League goals and seven assists so far this campaign. Unai Emery is planning to partner Maddison with Lucas Torreira and Matteo Guendouzi as part of a new look midfield next season.